Generally, a stock is either more growth-oriented or a conservative, safe play. Wells Fargo is both. Some say the Holy Grail of investing is to find stocks that provide safety, as well as significant growth potential. In the banking sector, this can be found in Wells Fargo, the largest publicly traded bank in the world in terms of market capitalization. Not only does Wells Fargo have a strong competitive position that helps its investors sleep well at night, but the bank is extremely ambitious when it comes to growth and expansion. Here are a few reasons why Wells' stock can be a good fit for any portfolio. As we know all too well, many banks have had plenty of poor assets on their books, and many are still trying to wind down their portfolios of bad loans. Asset quality can help separate the wheat from the chaff in the banking industry. Wells Fargo has historically had a portfolio of much better quality than its peers, as evidenced by the bank's performance during and after the financial crisis. During that turbulent period, Wells' quality portfolio allowed it to take advantage of strife elsewhere by acquiring weaker competitors at steep discounts. In fact, in 2007, Wells Fargo was the only U.S. bank to be rated AAA by Standard & Poor's. Wells Fargo has grown tremendously during the past few decades, through both organic growth in its existing businesses, and acquisitions. During the past 10 years, Wells' assets have increased by 250%, from $427 billion to more than $1.5 trillion. Between 1986-2012, Wells made 18 separate acquisitions -- including Wachovia in 2008 -- which catapulted the company into the upper tier of U.S. banks. As a result of these acquisitions, the company has grown into a network of 9,000 retail branches, and is the largest retail mortgage lender in the country. Wells has also grown its investment banking division -- which was virtually non-existent before the Wachovia acquisition -- into one of the largest in the U.S. The company has expressed its intentions to continue to grow that arm at a double-digit percentage rate for the foreseeable future. Unlike a lot of other big banks, which are currently paying extremely small dividends, Wells Fargo has impressed regulators with its quality portfolio, and has been given the green light to pay out much more to its investors than its peers. As of this writing, Wells Fargo's stock sports an annual yield of approximately 2.6%. Although that may not sound like much, consider that two of its largest competitors, Bank of America and Citigroup, are still paying a mere $0.01 per quarter. Wells has historically been very good about raising its dividend regularly, and I would expect to see this trend continue into the future. Now, how can I say Wells Fargo is a good value when it trades at a markedly higher valuation than peers like Bank of America and Citi? Wells trades for about 2.3 times tangible book value, versus the multiples of 1.2 and 0.9 for B of A and Citigroup, respectively. I view Wells Fargo's asset quality and top-notch management as fully warranting a premium valuation. Further, the stock is notably cheap versus its historical valuation. 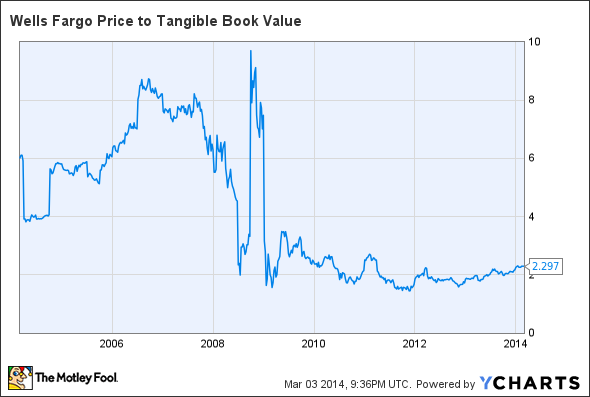 As recently as 2009, Wells Fargo saw its price-to-TBV as high as 3.7. Before the crisis, shares traded for TBV multiples that regularly breached four. While I have no delusions those valuations will be seen again anytime soon, I don't think a multiple of three to four times TBV is out of the question in the next few years, especially if the banking sector keeps improving as it has. Of course, you don't need to be an investor that checks a style box to appreciate Wells Fargo's stock. At the end of the day, it's a strong business with quality management, a stable dividend, and a reasonable valuation. And that's a combination that's hard for any investor to turn down.